Western Armenia, incorporated in the 17th century to the Ottoman Empire, is made of the six vilayets (Turkish districts) of Erzurum, Van, Bitlis, Diyarbekir, Kharput, and Sivas. The National Council of Western Armenia claimed the legal succession of the structure that held two congresses in 1917 and 1919 and sent 12 elected representatives of Western Armenia to the Parliament of the First Republic of Armenia. The Government in exile of Western Armenia was formed in Paris on 4 February 2011 (text). On 4 September 2011, the Council and the Government in exile requested the UN to implement the Decision issued on 22 November 1920 by Woodrow Wilson, that is the recognition of the borders fixed by the Treaty of Sèvres, which would mean the transfer of Western Armenia and Cilicia to Armenian sovereignty (text. The Council and the Government announced in October 2011 the organization of elections for the Assembly of Western Armenia's Armenians (text). The so-called "Turkish" Armenia shall be renamed Western Armenia (Hayrénik). Western Armenia (Hayrénik) shall have a flag, a coat of arms and a national anthem. The flag of Western Armenia (presentation) "symbolizes the Armenian Highland, as the birthplace of civilization." At first glance the structure of the flag resembles the Ejmiatsin flag. Also we see that the flag depicts the Armenian Wheel of Eternity at the center. The eight-pointed Armenian star is distinctly noticeable around the eternity sign. And, of course, the Christian cross on the backdrop. Colors remind us of many west Armenian flags but I am not sure about their precise meaning. Grand Prince Roland Bagratouni, "Legatee of the Throne of Western Armenia", lives in Budapest (Hungary). He expected the Kingdom of Western Armenia to be soon recognized by the UN and integrated into the European space and NATO (interview). The Government of Western Armenia plans to appeal the Turkish Government to recognize it and to give up the region of Ani, once the capital of Armenia. The Grand Prince claims that national symbols of statehood and passports are already prepared. The flag (image proposed for the claimed Kingdom of Western Armenia is quartered orange-pink red by a thick blue decentered cross, with a coat of arms over the cross. The arms proposed for the claimed Kingdom of Western Armenia are "Quarterly by a cross gules, 1. Azure three roses gules, 2. Or a cross gules, 3. Or a lion gules, 4. Azure three sons or, overall an escutcheon or a lion gules". Supported by two lions or, the shield is placed on a mantle hermine and surmounts a scroll or with the writing "ARMENIA LIBEROI", in Armenian and Latin scripts, sable. The Grand Prince's blog presents the yellow shield with the red lion as the coat of arms of the "Kingdom of Kars & the Great Princedom of Bagratouniq & the Princedom of Ani and of HM the King of Ani & HM the Great Prince of the Bagratouniq & HM the Prince of Ani". The three roses are shown on a coat of arms presented as the arms of the "Armenian Imperial Bagratouni-House in hiding from 1789 of the Poland's days with on voice von Antoniewicz de Boçoz (Paul, Pauli) gentilitial family in result of the concealed concord for His Majesty Austrian emperor Joseph II von Lothringen-Habsburg". Hamshen (forum) are a Western Armenian ethnic group, originally from the Black Sea coast's Hemşin district of Rize province of present-day Turkey. Almost evenly split in religion between Sunni Muslims and Christians. Presently, some of them still live in Turkey, while most moved to Russia (Krasnodar Territory, Sochi, Adygeya), to Armenia, Abkhazia and Artsakh/Nagorno-Karabakh. Their numbers are estimated at 500 000 to 700 000. They speak Homshetsma, a dialect of Western Armenian. 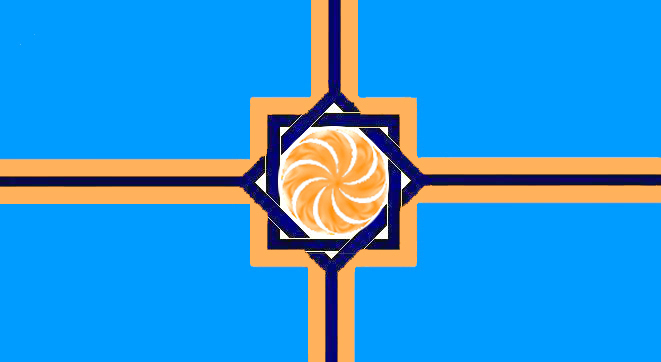 The reported Hamshen flag is made of a blue cross on a field quartered red-orange-orange red (clockwise), otherwise, in the Armenian national colors.